A year ago, a pole was dug deep into the muddy vastness of Meerut’s Jagriti Vihar, a huge ground in this crowded western Uttar Pradesh city. One giant saffron flag went up at 101 feet. In its shadow were nearly 350,000 people, most of them uniformed in brown and white, breaking into military-style salutes. Rashtriya Uday was touted as the biggest-ever congregation of the Rashtriya Swayamsevak Sangh (RSS), the ideological parent of the Bharatiya Janata Party (BJP). Sunil Kumar Singh, 35, a Jatav and resident of Modipuram, on the northern fringes of Meerut, was one of the key organisers. The Jatav community, to which the Bahujan Samaj Party leader Mayawati belongs, accounts for nearly 55 per cent of the Dalit population in Uttar Pradesh. They are also Behenji’s core voters. The Jatavs are more politically active than other Dalit sub-castes, have had a history of Sanskritisation and are considered to be against the upper-caste leanings of the RSS. On behalf of the RSS, Sunil invited supporters of the Ravidas ashram in Pavli Khas, close to his home. Ravidasis are another Dalit sub-caste. Vijay Das, a teacher at the ashram, says RSS footsoldiers are the ones they turn to for municipal issues and basics such as medicines and school textbooks. Vans of Sewa Bharti, the community service wing of the RSS, ferry medicines to Dalit colonies and that is probably why many Ravidasis campaigned for Sangeet Som. A Thakur, Som is the BJP MLA from Sardhana. In the 2014 Lok Sabha elections, the BJP’s vote share among Dalits increased by 12 percentage points and the BSP’s dipped by six. A resident of Meerut Cantonment, Raju says he supports Prime Minister Narendra Modi because he built toilets and provided LPG cylinders which replaced smoky stoves in poor households. Nearly 5,000 Jatavs like him live in the cantonment, which elected the BJP’s Satya Prakash Agarwal to the Assembly with 1,32,518 votes. There is an economically weaker section within the Jatavs that seeks vikas, the mainstay of the BJP campaign. Voters don’t change allegiances overnight, but the RSS has lodged itself in people’s memory over time and is making inroads. Proof of this are hundreds of people like Sunil who graduated from RSS-run schools and hold views different from that of the cadre-ised BSP voter, who shares a near familial bond with party founder Kanshi Ram and Mayawati. In the 2017 Assembly elections, the BJP fielded Jatav candidates in only 21 of the 85 constituencies that are set aside for Scheduled Castes. It left 49 seats for other Dalit communities such as the Paswan, Dhobi, Kori, Valmiki and Khateek. One of the reasons for the BJP losing out on the intelligentsia and the more radicalised Jatav Dalits such as the Ambedkarites is its lack of strong Dalit leaders. Of its two prominent Dalits, former party president Bangaru Laxman didn’t catapult into a leader of national appeal and President Ram Nath Kovind’s SC status was seen as incidental. The RSS might also have failed to stem radicalisation among Dalits, which is why the BJP has also focussed on the non-Jatavs, who account for 14 per cent of the state’s total Dalit voters. But, in and around Meerut, a section of the Jatavs seems to be veering away from the BSP. Modi’s glowing utterances about BR Ambedkar, the architect of the Constitution, have not gone unnoticed. On February 19, the RSS will host events on Ravidas Jayanti in Jatav-dominated areas. There are 850 seva karyas, or centres, in western Uttar Pradesh and 500 of them are in Dalit-dominated areas, says Ajay Mittal, the region’s RSS prachar pramukh. From stitching to computer training, these centres that the RSS runs with an affiliate called Sewa Bharti are imparting skills that can help the young to earn a livelihood. Of the 2,200 shakhas in his district, not one lacks Dalit participation, says Seva Das, the RSS pramukh from Muzaffarnagar. “The BJP plays the Dalit card strategically,” says Rajneesh Sharma, whose organisation Analog International conducts market research for political parties. BJP Dalit leaders bring upper caste leaders to the homes of Valmikis and Jatavs for sehbhoj, a community meal, says Sharma, who has studied voting patterns in and around Meerut. The broader question to the Jatav/non-Jatav dynamics is how the BJP versus gathbandhan (alliance) battle will play out in western Uttar Pradesh. Since the alliance isn’t a national one, the local voter won’t want instability at the Centre, says Sharma. The transfer of votes within the gathbandhan isn’t a given—a Muslim candidate fielded by the Samajwadi Party on a BSP turf may not appeal to the Jatavs. Last year, protests against alleged dilution of a law protecting Dalits turned violent in Shobhapur, near Meerut. Jai Kant Singh and Manish, both Jatavs, were arrested for inciting violence and spent eight months in jail. “Our problem with the BJP is that the local administration is suspicious of us, but even the BSP did not help us get out of jail,” says Jai. but the scope for identity assertion within the larger machine of the party is limited and the Jatavs know that, says Joginder Kumar, Meerut chief of the BSP’s Dakshin Vidhan Sabha. 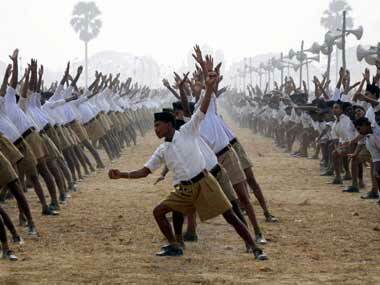 How much fruit the RSS’s efforts will yield remains to be seen. But as the forces of Hindutva catalyse new shifts in the political and social landscape of Uttar Pradesh, it could make a dent in Mayawati’s long-tended flock of faithful.